Malice: A First Clues Mystery Series for Kids. 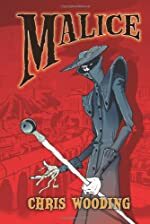 About the series: Everyone's heard of Malice, but hardly anyone has actually seen it: a comic about a horrifying world of tricks and traps, overseen by the sinister master of ceremonies, Tall Jake. The story goes that the kids who go through Tall Jake's deadly trials are real kids, who've disappeared from the real world and turned up in the comic. But it's just an urban legend, right? Seth and Kady think so. Until their friend Luke tells them that he's found a copy of Malice, and the next day he disappears without trace. Seth and Kady investigate, and in doing so, they discover the awful truth. The legends are true. Malice is real.